Do you suffer when you ski or ride? We’ve Got the Fit and the Solution! 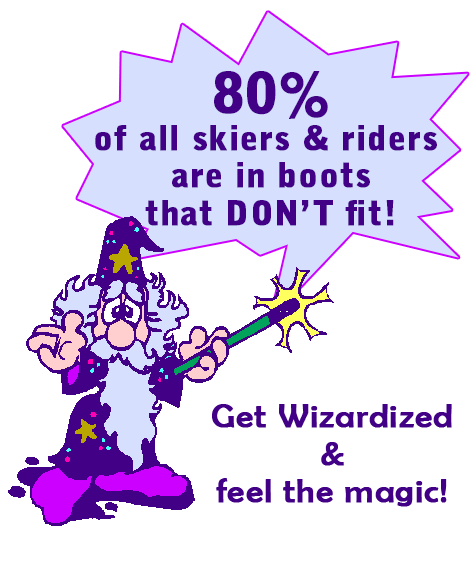 For the ultimate in skiing pleasure, allow the BOOT WIZARD® to provide a custom boot fitting and you will have happy, comfie feet. A custom fit requires time and patience as no two feet are alike, even on the same body. Most fit problems result from lack of foot support, so building a foundation is most important. A free evaluation begins with a detailed assessment of the feet, ankles, legs and knees. Then your boots are examined for telltale wear patterns, proper size and correct function. 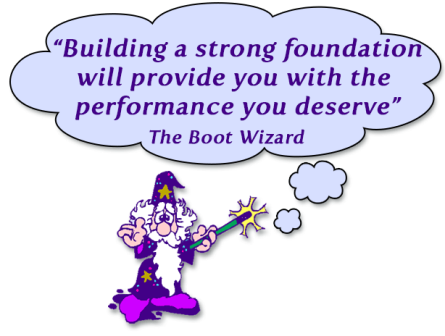 With this information the Boot Wizard can determine what needs to be done to correct your problem and what it will cost. You decide how you’d like to proceed and how much you’re willing to spend. The Boot Wizard can improve almost anything, providing the boot is not excessively big and is a suitable model for your ability and foot shape. If it isn’t, the Boot Wizard can teach you how to purchase properly fitting boots, even accompanying you to the store. You are not limited to ski boots (downhill, cross country or telemark). The same application works for snowboard boots, ice skates, hiking boots, golf shoes, inline skates and training foot wear. The Boot Wizard only takes new clients by appointment. Contact the Boot Wizard and be a part of your solution to great feeling feet. Serving Kananaskis, Canmore, Banff, Lake Louise and every FOOT in between!